Man beaten to death in Dadri: The attack on Akhlaq and his family took place around 10 pm after an announcement about the family consuming beef was allegedly made at a local temple, police said. A 50-year-old man, Mohammad Akhlaq, was beaten to death and his 22-year-old son severely injured on Monday night in UP’s Dadri, allegedly by residents of Bisara village, after rumours spread in the area about the family storing and consuming beef, police said. Six people were arrested in connection with the attack, around 45 km from Delhi, sparking protests that led to police firing, damage to vehicles and injuries to a 20-year-old welder who works for the National Thermal Power Corporation (NTPC) facility in the area. Police said they have sent samples of meat taken from Akhlaq’s home “to the forensics department for examination”. 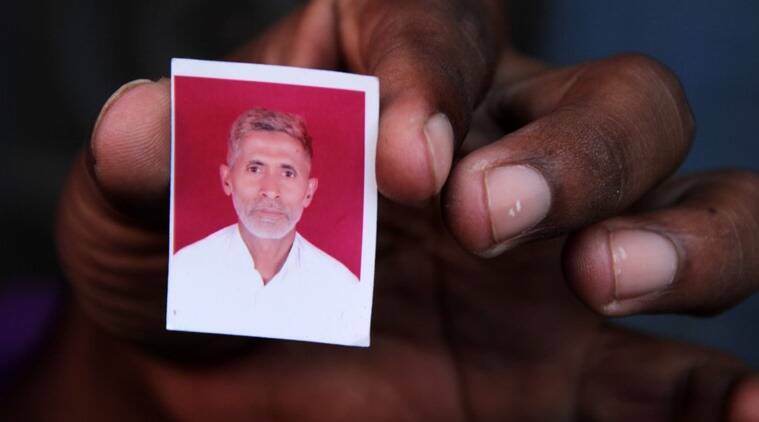 Akhlaq’s daughter, Sajida, said the family had “mutton in the fridge” and not beef. The attack on Akhlaq and his family took place around 10 pm in Bisara after an announcement about the family consuming beef was allegedly made at a local temple, police said. While Akhlaq, a farm worker, succumbed to injuries suffered during the attack, his son Danish was admitted to a government hospital where doctors described his condition as “critical”. Gautam Budh Nagar District Magistrate N P Singh said police have been deployed in the area and “as of now, the situation is under control”. “Some locals spread rumours that Akhlaq had cow meat at his home and engaged in cow-slaughtering. Following the rumours, tension ignited and some locals attacked his home in Bisara village,” Singh said. While a shopkeeper near the temple and Bisara village sarpanch Sanjeev Kumar Rana claimed that those arrested included the temple priest and an aide, police said the priest — identifed only as “babaji” — was released after questioning. Senior Superintendent of Police (SSP), Gautam Buddh Nagar, Kiran S, said “preliminary investigations revealed that an announcement was made from the temple” about the family consuming beef. “The priest was picked for questioning as we need to investigate the involvement of others in the case,” said Kiran. According to Sajida, Akhlaq’s 18-year-old daughter who was in the house when the attack took place, “a group of more than 100 people from the village” reached the house that night. “They accused us of keeping cow meat, broke down our doors and started beating my father and brother. My father was dragged outside the house and beaten with bricks. We came to know later that an announcement had been made from the temple about us eating beef,” said Sajida. According to the SSP, a case of rioting and murder has been registered against 10 people. “Six of them have been arrested — Rupendra, Vivek, Sri Om, Sandeep, Saurav and Gaurav — all residents of Bisara village,” the police officer said. “We have been told that a group of people entered the temple and used a microphone to make the announcement. However, investigations are still underway. We do not know if any of the accused are associated with the temple. We have collected meat samples from Akhlaq’s house and sent it to the forensics department for examination,” said Kiran. However, as news of the arrests spread, residents from Bisara and neighbouring villages held demonstrations and clashed with police near the NTPC facility, damaging vehicles, including a police van, and burning a motorcycle. When police resorting to firing, Rahul Yadav, who works as a welder at NTPC, received a bullet injury near his abdomen. Yadav’s brother Narendra said they “got caught in the clash” and alleged that his brother was injured by a bullet fired by a policeman. “Around 500 protesters from nearby villages had assembled there. A policeman fired a shot in the air but it hit Rahul on the side of his abdomen,” he said. Senior officers, however, contested Narendra’s version that his brother was hit by a police bullet. “Rahul Yadav received a bullet injury on his lower hip. We are yet to ascertain the type of the bullet and the weapon from which it was fired,” SSP Kiran said.